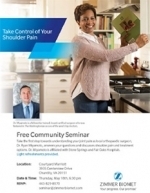 Dr. Miyamoto will be speaking about Treatment Options for Shoulder Arthritis and Rotator Cuff Tears at the Courtyard Marriott in Chantilly, VA on Thursday May 18th at 6:30PM. This is a free seminar. Light refreshments provided.